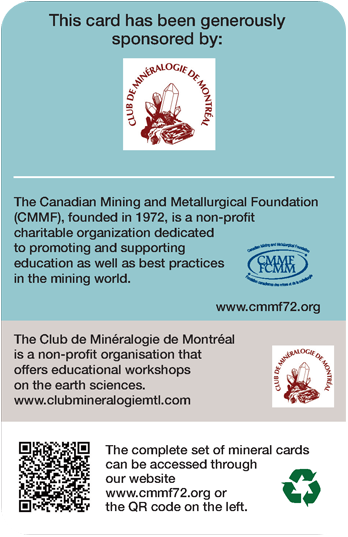 The CIM Foundation (CIMF) has partnered with key organizations to create special collections of Mineral Photo-Cards – an innovative learning tool for primary, high school and University students. 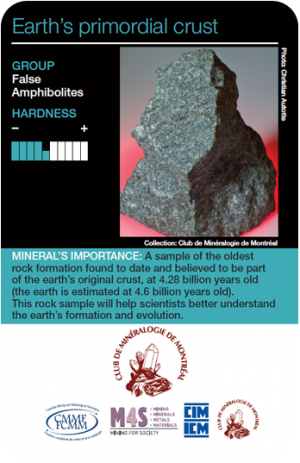 The Mineral Photo-Cards were created jointly with CIM and the Club de Minéralogie de Montréal (who are CIM members) and are designed to be informative, attractive, collectible, and just the right size for small hands. They are available at the educational M4S show, held during the 2012 CIM Conference & Exhibition in Edmonton, Alberta, May 3-5. Educators were provided with complete sets while individuals received single cards, all free of charge. Each card will have a QR code and URLs printed on the back, so attendees can download the remaining cards. The cards will also be offered to other educational outreach programs and exhibitions across Canada. The set of cards, each featuring a photograph of a mineral, a short description of the mineral’s appearance and use, as well as other essential facts, will be printed in English, French and Inuktitut. When CIMF identified the need for a learning tool that would document minerals in a suitable format for students and the general public, they discovered that comprehensive products were not widely available. The Mineral Photo-Cards project was created as a vehicle to interest students in the earth sciences while promoting the mining industry. The set of cards is being produced thanks to funds received from generous benefactors, as well as companies who are sponsoring the cards on a one-year or three-year basis. The cards will be distributed as widely as possible through networks, such as the CIMF, Dynamic Earth, Club de minéralogie websites, the CIM conferences, M4S, and other events. In addition to the online cards, over 80,000 cards showcasing minerals from collections from over 15 partners nation wide are now in circulation across Canada and available in English and French with some cards also available in Inuktitut. For most part, the complete collection of cards are distributed electronically. Each card has a QR code as well as URLs printed on the reverse of the card. Students who receive a card will be able to download the additional cards to complete their research. Deborah Smith-Sauvé, dsauve@cim.org (514) 939-2710 ext.1334. We are also looking for other ways to distribute these mineralogy cards to even broader audiences.